Your morning routine doesn’t include enough old-school gaming. Break the caffeine habit and get your Mario on at the same time with the help of the Super Nincoffee Jr.
[Luigifreakout123] shares the details of the build in the video clip after the break. He starts by revealing that this is the second version he’s made. The first wasn’t a Jr., but instead used a full-sized Mr. Coffee unit. Neither make coffee, but instead serve as an enclosure for the gaming hardware. The on/off switch and original power cable are used to control the electricity to the console. Openings have been cut in the tops and front for a game cartridge and the two controller ports. A composite video and stereo audio cable comes out the back of the machine next to the power cord. Yeah, it’s super simple, but sometimes that all it takes for a project to be a delight like this one is. [Jerry Pommer] and his wife have relied on a percolating coffee pot for years. We have fond memories of camping trips with these things; they make great coffee which tastes even better on a cold morning in the back woods. But a recent package from the stork means that they no longer have time to sit and watch the coffee perk. After several days of boil-overs [Jerry] switched to this very basic drip coffee maker he salvaged from the trash pile. It has one switch that turns it on and off and nothing else. In order to make sure he doesn’t forget to turn it off, he hacked together his own shut-off timer for the device. His write-up is all back story, but the 34 minute video embedded after the break takes us through the hack itself. We like it that he starts by discussing the different options that he could have chosen. Of course it might have been a microcontroller, or a 555 timer keeping time. But in the end he went with a simple resistor-capacitor timer. The carefully calculated component pair drives a Darlington transistor which keeps a relay closed. When the slowly draining capacitor lets the voltage drop past a certain threshold it also kills the power to the hot plate. In this case it will only stay on for about a half hour. We keep seeing commercials for those Keurig coffee makers that use a plastic pod of grounds to brew just one cup of coffee. We’re pretty sure this is a fad, and absolutely sure that the extra packaging created by brewing with this method is a waste. But to each his own. [Danman1453] has two of the devices. One he bought, the other is a warranty replacement. He decided to scrap the malfunctioning unit and see if he could put it to good use. What he ended up with is the aquarium pumping system you see above. It is conceived as tidier way to swap out the water in the fish tank. He had been using tubing to siphon the water, but found he almost always made a mess. This system uses an air pump to prime the water pump by pressurizing the tank which forces water into the lines. Once the water pump is primed he switches over to that for the rest of the work. 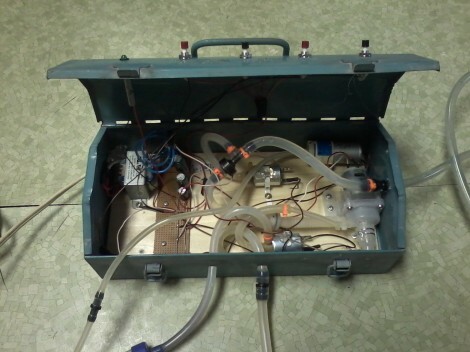 He used an old metal tool box as an enclosure, using the cover to mount the push-buttons which route power to various components when pressed. Many of the parts were transplants from the coffee maker, but even if you sourced all of the components new this wouldn’t cost too much to put together. Here’s [Rob]’s free form circuit that’s a Christmas ornament for geeks. It looks great, but sadly isn’t powered through a Christmas light strand. It’s just as cool as the skeletal Arduino we saw. Well this is interesting: protoboard that’s specifically made to make SMD soldering easier. 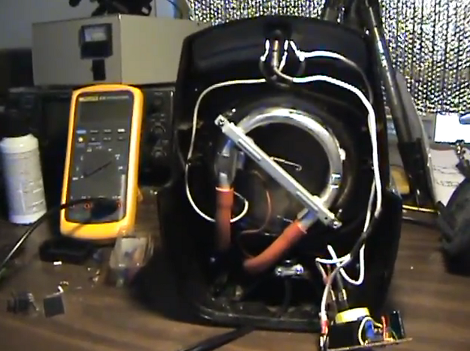 The guys at elecfreaks went through a lot of design iterations to make sure it works. The days are getting longer and cabin fever will soon set in. 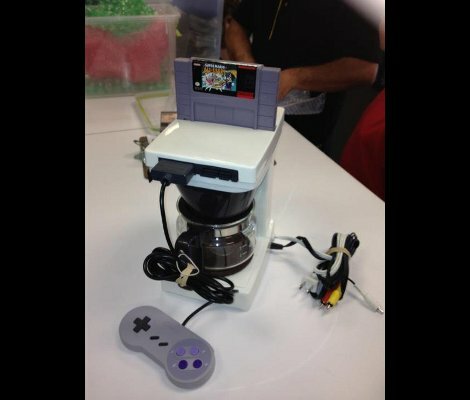 Why not brew beer in your coffee maker? It’s an oldie but a goodie. With just an ATtiny and a little bit of futzing around changing the coefficients of a partial differential equation, you too can have your very own oscilloscope Christmas tree. Don’t worry though, there are instructions on how to implement it with an Arduino as well. HaD’s own [Kevin] might be the one to beat, though. So what exactly does a grip do? You know what your home movies need? A camera crane, of course. You’ll be able to get some neat panning action going on, and maybe some shots you couldn’t do otherwise. Want a demo? Ok, here’s a guy on a unicycle.